Public transport in Lucknow is often a nightmare for residents as government buses never maintain a time-schedule and run erratic services. Lucknow has a dense network of buses, auto rickshaws, tempos and cycle-rickshaws. Under the Smart City project, Lucknow Municipal Corporation is preparing a well-integrated urban mobility plan which is aimed at easing traffic congestion. The biggest problem in UP cities is that there are no identified stoppages for public transport putting commuters to daily hassles. The state government buses randomly stop on roadsides causing inconvenience to the traffic flow. Second, the transportation network is largely unmetered and there is no proper monitoring of cash flow due to daily ticket sales. Taking advantage of unmetered transport system in Lucknow, local drivers often fleece the commuters. The Smart City plan will introduce organised meter readings, smart auto and bus shelters, determining exact arrival time of vehicles, ample infrastructure for cyclists and pedestrians, among others. Under the ambitious urban project devised by the Lucknow Municipal Corporation, new flyovers will come up at traffic congested areas. LMC has already identified three spots -- Burlington crossing, GPO crossing and Sikanderbagh crossing. LMC officials said though more flyovers are required in Lucknow, these three places have been targeted first given the heavy traffic flow. The focus is also on providing footpaths for pedestrians throughout the busy areas in Lucknow. The Smart City concept attaches much importance to laying down aesthetic and durable footpaths with interlocked tiles across all arteries in Lucknow. Another priority area would be the setting up of multilevel parking lots in markets and commercial areas. The Smart City plan also proposes construction of smart bus and auto shelters on public-private partnership (PPP) model. These would become stoppage points for public transport vehicles. Lucknow Municipal Corporation will work as a nodal agency to bring these changes in urban mobility plan. For effective implementation, LMC is coordinating with a host of departments like PWD, RTO, traffic police and Lucknow Development Authority. 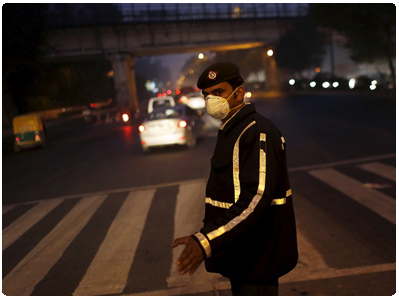 Lucknow has 411 crossings and tri-sections but to man them, traffic police has only 161 personnel as on January 2015. Increasing the strength of traffic personnel is an important part of a new regulation policy along with increasing the use of technology in enforcement and traffic management. Lucknow has more than 19 lakh registered vehicles as on January 2015. 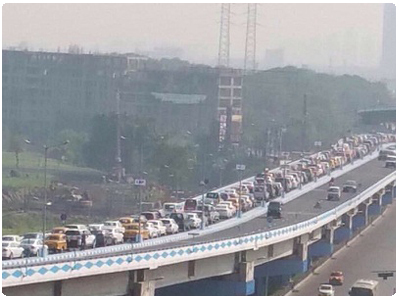 Besides, 2 lakh vehicles move in and out of the district every day. In the year 2014 till October, 1.2 lakh vehicles got registered with the regional transport office in Lucknow. Widening of prominent roads and intersections to increase their capacity to accommodate more vehicles. GPS devices to be installed in buses for determining their location and exact arrival time at a stop. A reserved booking system may be implemented, where passengers can book their seats in advance. Flyovers proposed at Sikanderabagh, Hazratganj and Berlington junctions. Footpaths in all non-vending zones for pedestrians. Autos and buses to operate through metered reading so that public can tender the exact amount. Public transport vehicles to stop at identified stoppages for the commuters to board in without any trouble. More multilevel parking lots in markets and commercial areas. The roads in Uttar Pradesh account for more deaths than any other state in the country. The National Crime Bureau Record (NCRB) Report 2013 points out that road mishaps claimed 1,37,423 lives in 2013 across the country and UP accounted for 15,630 of these fatalities. While UP accounted for 11.4% of total road accident deaths in the country, TN accounted for 11.3%. Other states in the list are Andhra Pradesh (10.7%), Maharashtra (9.6%), Rajasthan (7.1%) and Karnataka (6.6%). In UP, 13.8% of the road accidents involved trucks which are mostly commonly used to deliver a range of cargoes for industrial development in the state. While traffic police in Lucknow and other major cities are trying their best to create awareness on following road norms, a host of factors leads to spiralling road casualties. The steady rise in the number of motorists and narrow roads contribute much to vehicle mishaps in UP cities. 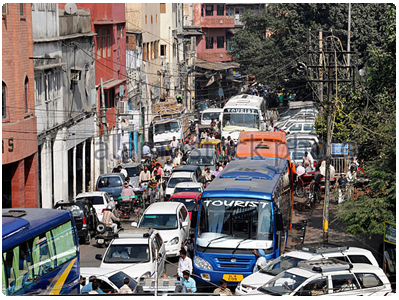 UP has its vehicular traffic running without a policy. UP traffic directorate has prepared a 5-point charter of demands for traffic regulation. The districts are formulating specific traffic regulation policy based on the five points. The traffic directorate prepared the charter for only Lucknow initially but later it was circulated to be followed across UP districts. Each district has the right to prepare its own traffic regulation policy based on local traffic conditions. 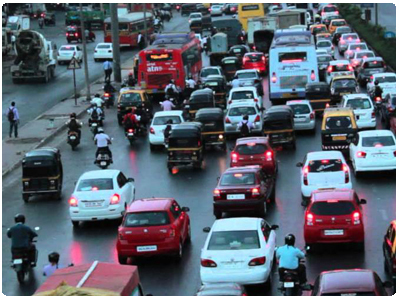 Traffic Regulation Policy is being formulated under the road safety initiative of the state government. As many as 56 districts have submitted their traffic policy to the directorate. UP gets an average 8 lakh vehicles added to the 'in-use' fleet every year. There were plans made to regulate traffic as and when the need was felt but a 'codified' traffic regulation policy never existed in any of the cities in Uttar Pradesh. The policy focuses on critical issues like on what stretches movement of heavy vehicles will be allowed (or prohibited), at what timings can light commercial vehicles move through certain roads and what routes can be developed as one-ways. Moreover, traffic-related issues like requirements of additional parking and which stretches could be declared congestion-free in the cities are being dealt with at the regulation policy. Streamline movement of heavy, light commercial and private vehicles. Regulate movement of city buses, hired vehicles, private autos and taxis. Arrangements at major public transport hubs like railway stations, bus stands and airport by ensuring easy availability of reliable pre-paid vehicles. There is a need to avoid the queuing of commuters at these busy traffic hubs. An effective public complaint system should be in place. Specific areas of congestion like schools, hospitals, malls and institutes should be identified for being made congestion-free. Public information gathering should be strengthened to rid cities of unscheduled traffic. Chief Minister Akhilesh Yadav is taking steps to introduce an exclusive cycle tracks in major cities of UP. If everything goes as planned, Lucknow, the capital city, is poised to be branded as the cycling city of India. Lucknow has already got cycle-tracks which run parallel to the main roads. This network will increase and soon the city of Nawabs would also be known as a city of cycle-tracks in the country. 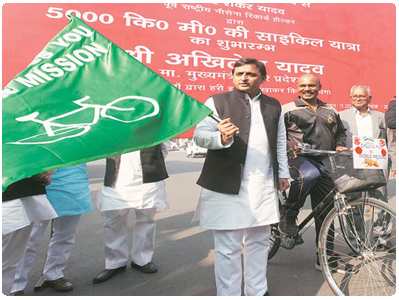 The ruling Samajwadi Party in UP is promoting cycling in a big way. The party has drawn up plans to have cycle tracks in almost all the big cities in Uttar Pradesh. The idea of promoting cycling will not only ensure good health for the people but also protect the environment, according to CM Akhilesh Yadav.